One example of this for this is the Harvard Medical School, where …….instructors were struggling to train students to listen to patients and make strong diagnoses based on the symptoms they heard. As an experiment, the medical school offered an elective module to students, where once a week they would join a fine arts class using the “See, Think, Wonder” thinking routine to observe art. After 10 weeks, all the medical students were assessed on clinical diagnosing and the students who had done “See, Think, Wonder” had improved much more than those who had not participated. 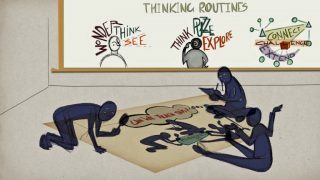 “One of the reasons we call them thinking routines is that through their use it is the thinking that becomes routine,” says Ritchhart said from Project Zero.